How many truck enthusiasts know that Guy trucks were once part of Jaguar.... or that todays Hino importer, Pino Harris, was yesterdays Guys agent in Ireland? 1975 Guy Big J GYT26 (872 CIK) in the livery of Dublin Bus is one of four artic tractors in the museums collection. The dormant Irish economy of the fifteen years after World War two reflected itself in the small number of commercial vehicles on our roads. A knock-on effect was that some marques were barely known here, a case in point being Guy. People with an interest in vehicles who visited Northern Ireland during those years would have encountered the magnificent Guy motor and trolley buses operated by Belfast Corporation Transport; happily, both types are represented in the Museum collection. At that time, Belfast was a mecca for the connoisseur of commercial vehicles and every visit showed more markedly how limited was the range of makes operating south of the border. And Guys certainly made a big impression on anybody meeting them for the first time. The earliest home encounters I can recall with the Wolverhampton products were one or two forward control vans, probably Vixens, operated in the fifties by Chivers, the jam and jelly makers then based in Clonskeagh, Dublin. When large numbers of second-hand buses began arriving from the United Kingdom in the early sixties, one exotic import was a Vixen owned by Kennedy's of Annascaul on the Dingle peninsula  that operator's present vehicles seem light years away from that solitary Guy. In the early sixties the Guy Warrior and Invincible ranges of AEC-engined chassis with very distinctive and modern fibreglass cabs also appeared here. An Irish agent - Harris, later of Hino fame - was appointed and made considerable inroads in a market then expanding as a result of our awakening economy. But, at the same time, a whole raft of changes then engulfing the entire commercial vehicle industry changed the scene  and Guy's position - irrevocably. Effectively, the flowering of the marque here was but a delayed action phenomenon being relentlessly overtaken by events in Britain. Guy Motors, a proud independent manufacturer with a pedigree going back to 1914, was taken over in 1961 by Jaguar. The prestige car maker In turn merged with the British Motor Corporation to form British Motor Holdings. 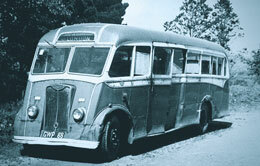 While it was but one of the many victims of the constant upheavals in the British motor industry in the sixties, Guy was to some extent responsible for its own troubles, mainly because of the revolutionary but ill-starred Wulfrunian double-deck bus. The only new Guy model launched under Jaguar ownership, and appearing in September 1964, was the Big J; the title proclaimed to all and sundry that Jaguar was now building large commercial vehicles. The Big J was built alongside the Invincible and Warrior until 1967; after then it was the only Guy heavy range. Jaguar replaced the historic Indian's head with a capital J badge on Guy vehicles; the Indian's head and the motto "Feathers in our cap" went back over forty years and was a most distinctive radiator cap. The Big J was designed around a new Cummins V6 engine, intended for motorway operation. This proved less than satisfactory and was eventually joined by alternatives; AEC, Gardner, Leyland, Perkins and Rolls-Royce were all offered. The Big J cab, a Motor Panels design, also used by Seddon, became a walk-through unit when Guy dropped the V6 engine option. It tilted to 35 degrees, but preparatory dismantling took ten minutes. In 1968, when BMH became part of British Leyland, the Big J continued in production, the J being replaced in 1971 by the Leyland logo of the period. However, the model's future was predictably bleak and it was phased out by 1978, with other models similar to the Leyland Buffalo (AEC Mandator, Scammell Crusader and the BMC Mastiff which used a Guy chassis frame). Numerous Guy Big Js worked in Ireland, including a fleet of Big J4 tractors placed in service by CIE in the mid-seventies; these had the excellent Cummins NH220 straight six engine. Following the split of CIE into separate operating companies in 1987, the Guys were withdrawn in the subsequent rationalisation. 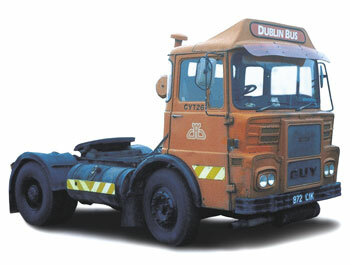 One tractor, GYT26 (872 CIK) of 1975, achieved distinction by appearing in the livery of Dublin Bus to the puzzlement of many observers, but the explanation was simple. Dublin Bus uniforms were transported in a semi-trailer box van which needed a prime mover, hence the Guy with the unusual logo. This tractor was one of three ex-CIE tractors chosen for preservation by John Smith and Joe Allidine of Irish Rail and now occupies an honoured place in the Museum collection.Within the past year, a Guy Big J4 platform lorry, with a specification similar to the tractor, was transferred to the Howth by the Office of Public Works.